Voice services like answering services, virtual receptionists, and call centers can be a time-saver for a company of any size. Answering services and potential clients should be aware that callers prefer an authentic, empathetic, and efficient phone call. 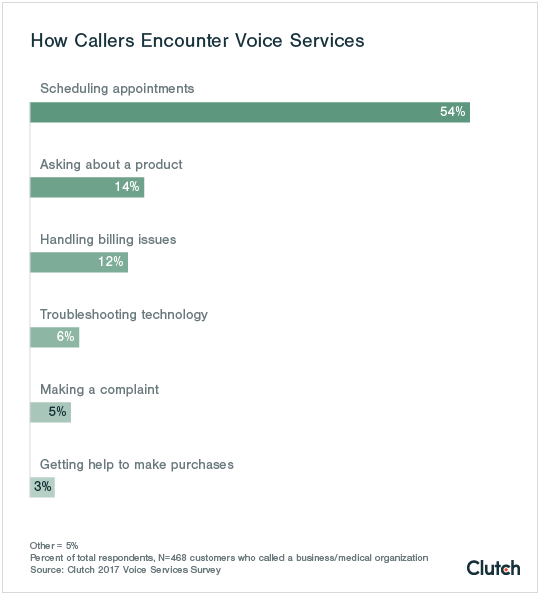 Clutch surveyed 468 customers who called businesses with an issue to see what qualities callers seek. Phone calls remain an indispensable part of most businesses’ communication with customers. Whether people call a business to schedule an appointment, settle a billing issue, or ask about their Internet connection, they expect the person on the other end of the line to help them solve a problem. That’s where voice services come in. When companies hire a provider to answer and handle their calls, they make a decision that affects how customers perceive them – whether the customers know they’re speaking with a voice services provider or not. Despite a growth in demand for voice services, there’s little hard data about this segment of business process outsourcing (BPO). 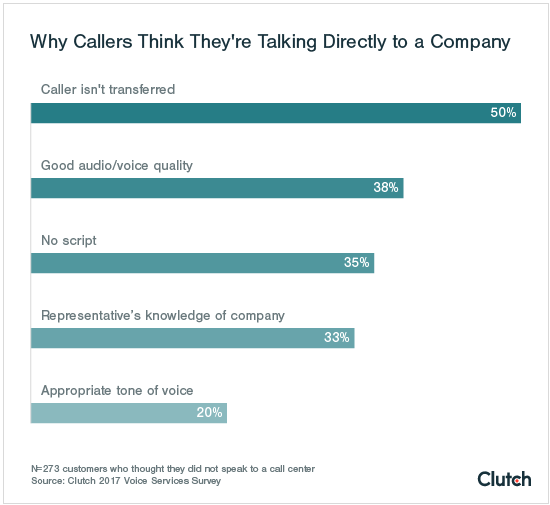 To gather more information on the industry, Clutch investigated customers’ opinions of inbound voice services. We surveyed 468 people who called a business or medical organization with a question within the past month. Our findings say that when customers call a business, they want to speak with real people who are effective, knowledgeable, and authentic. Over half (54%) of callers make a call in order to schedule an appointment, but they can call for many other reasons. The ability to speak with a human representative is the most important characteristic of any phone call, according to customers. 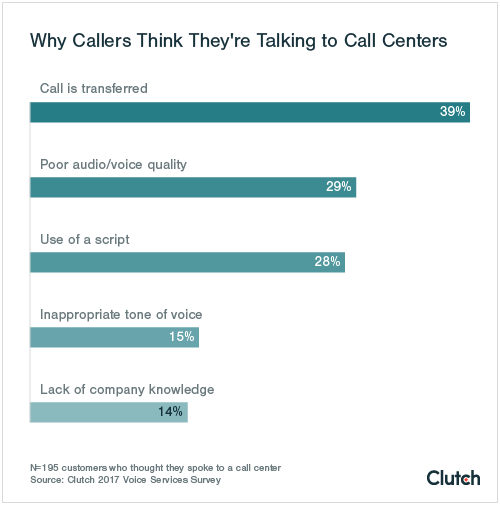 At 39%, getting transferred to another line is the top reason why customers think they're speaking to call centers, as transferred calls make customers think their calls don't matter. Less than half (44%) of respondents who thought they spoke to call centers had a completely satisfying call, meaning that answering services should be careful of how they're perceived. Voice services allow startups, mid-size companies, and enterprise businesses the chance to outsource tasks such as answering phones and scheduling appointments. When Company A pays Company B to handle its phone calls, Company A is using voice services. Company A then saves time it can use on other tasks. Over half of customers (54%) call a medical or business organization to schedule an appointment. Other common phone needs include asking a question about a service or product (14%) and handling billing issues (12%). The diversity of reasons that customers call a business shows that both enterprises and small businesses can benefit from voice services. “People that like our services are people who can’t afford to be on the phone a lot. Lawyers, for example, who may be in court. Realtors, who can’t answer the phone when they’re showing a house. We even have an airbrush tans specialist,” says Moises Hasbun, Executive Director of Easybee, an answering service based in El Salvador. An answering service is a type of voice service that receives, answers, and handles phone calls for its clients. Another type is a virtual receptionist, or a receptionist who isn’t present in an office. They handle appointment scheduling but sometimes tackle emails, document management, and other tasks. Here’s an example of someone who might use a virtual receptionist: Jane Penn is a well-known author, and her books involve copious interviews and research. She feels like she’s wasting time on logistics, so she hires someone to help. Tom, Jane’s receptionist, schedules interviews on Jane’s behalf. Even though Tom works in Denver and Jane works in New York, most of Jane’s interviewees never know that Tom is handling Jane’s calls from 1,800 miles away. Customers who call a business value genuine interaction with a person on the other end of the line. Whether people speak to a human or robotic representative, they value the same characteristic – the ability to speak to a person. Of those who speak to a person, 21% say that human interaction is the quality they appreciate most. Of those who use a phone menu or IVRR, a fourth (25%) say the option to speak to a person is the quality they appreciate most. Technology like self-driving cars and smart thermostats might successfully automate certain tasks, but not phone calls. “A computer voice is never going to be as effective as having an actual person answer the phone,” said Shawn Burst of Sales 360 to Adriana Lopez of Forbes. Nathan Strum, CEO of Abby Connect, a virtual receptionist company in Las Vegas, also believes that human representatives make customers feel most at ease, since talking to a real person indicates to a customer that someone is dealing with her issue. The best way to make a customer feel like his message will reach the right person, then, is to have a human representative answer the phone. Otherwise, the customer might not pass on his message at all. According to Hasbun, callers who land in someone’s voicemail are much less likely to leave a message. Sometimes, representatives may even have to assure customers that they’re real. “Customers think, at first, that they’re not talking to a real person. They ask, ‘Are you a live human being?’” says Maya Momotok, CEO and Co-Founder of Wow24-7, which provides both chat and voice services. A warm, friendly voice, suggests Momotok, leads to the best caller experience. Callers usually assume that they’re speaking to the business whose phone number they’ve dialed, not a voice services company. If callers experience transfers, low-quality audio, or answering service representatives who speak sub-par English and draw from a script, they may suspect that they’re speaking with a voice services provider. However, if representatives speak conversationally and resolve callers’ problems without transferring them, callers have no reason to believe they’re talking to an employee of a voice services company. Customers think they’re speaking to a call center employee if the answering service representative transfers the call, or if the call can’t be clearly understood. In an ideal scenario, the customer never realizes he’s speaking with an answering service. The representative provides such good service that the customer assumes he’s left a message with the client company. Sometimes customers do recognize that they’re speaking with an answering service, though. Most of these people will conclude that they’re talking to a call center, since they aren’t familiar with other kinds of voice services. 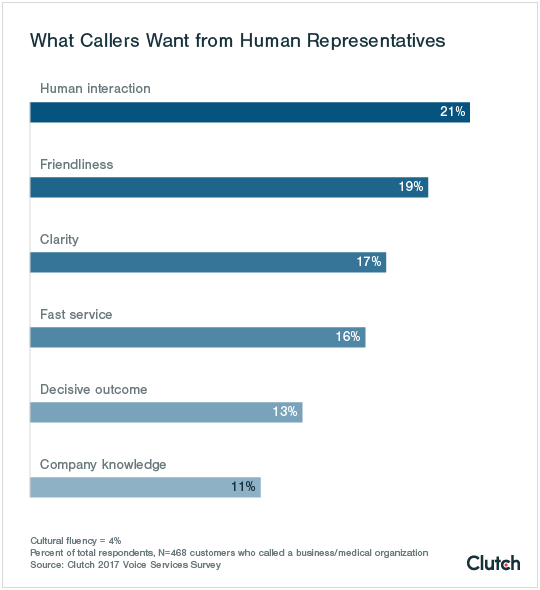 About a third (34%) of people who speak to a human representative think they’re talking to a call center employee, while 8% think they might be doing so. 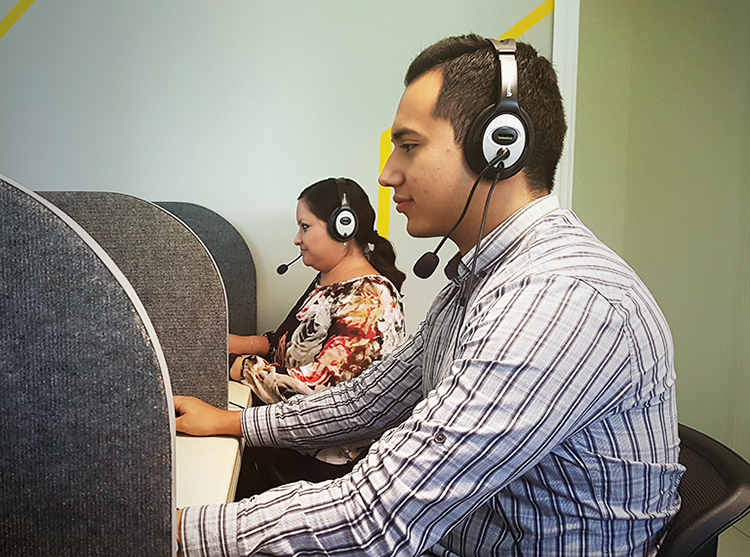 This group of callers can name a variety of reasons why they think they’re talking to a call center. However, customers mainly believe they are speaking to a call center when the call is transferred. Customers’ feelings towards being transferred doesn’t surprise Sebastian Tickle, Vice President of Operations at ItelBPO, a business process and contact center company headquartered in Jamaica. “Consumers are looking for quick speed-to-answer and resolution on the first call. They require clarity and content. Once they have that, your caller is going to be happy,” Tickle says. Making a caller talk to multiple answering service representatives lengthens the amount of time a resolution takes and can confuse customers. Answering services should ensure that their employees have enough knowledge about client companies to answer questions without transferring callers. At the least, employees should write down callers’ contact information and promise to alert the client company. In addition, providers should ensure that their employees speak clearly and conversationally so as to sound natural. Representatives who struggle to speak the target language (usually English), sound unfriendly over the phone, or read straight from a script are likely to irritate callers. 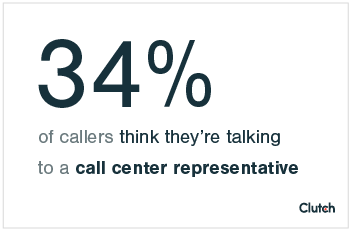 Customers’ distaste for call centers plays into stereotypes about call centers and their employees. According to such stereotypes, call center representatives lack the specialized skills to answer complex questions, don’t speak fluent English or speak with an incomprehensible accent, and have few social graces. However, most of these stereotypes are false. Indian voice services workers often bear the brunt of callers’ negative assumptions, most of which hold little truth, Nadeem says: “There’s a presumption of low quality.” Quality varies widely between businesses, though – just as it would in any industry and location. In Jamaica, too, these generalizations don’t always fit reality. 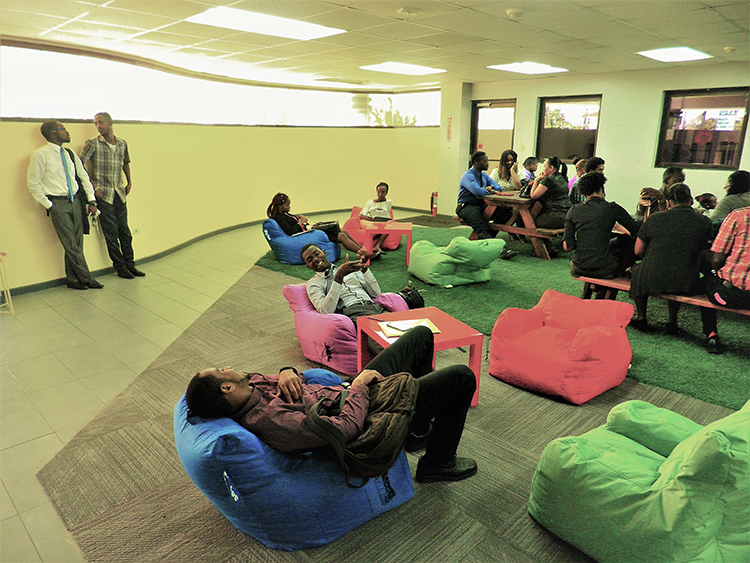 ItelBPO’s Kingston office, for example, doesn’t resemble the image of call centers as a dull, dreary workspace. Both providers and potential clients should be aware of, and avoid, cultural stereotypes towards their business’ location. Customers prefer phone representatives who don’t transfer them, and who are able to speak clearly and spontaneously. Certain qualities make callers think they’re speaking directly to a business. Half of customers think they’re talking to the business they intended to call because their representative helps them right away (that is, doesn’t transfer them). Almost two-fifths believed they spoke directly to the company because the representatives were both easy to understand and didn’t use a script. One-third said that the representative had a lot of knowledge about the organization the customers called. Respondents equate an interaction with a voice services employee with an ineffective or garbled phone call. Though this idea is not necessarily true, both answering services and virtual receptionist companies should take these qualities into account while training employees. The following advice can help both providers and potential clients evaluate a successful voice services interaction. To prevent customers from knowing they’re speaking to an answering service, representatives should be clear, helpful, spontaneous in their speech, and knowledgeable of the client company. Customers see these traits as authentic. At Easybee, for example, only three to five employees handle a single account so that each employee is familiar with the client company’s details. Easybee employees are then better able to address callers’ concerns, and some repeat callers may even come to associate particular representatives with the client company. Does the employee use language that is both personable and professional? Is the employee comfortable speaking the target language (usually English)? Does the employee offer to take a message, schedule an appointment, or perform another task that provides effective help? Can the employee answer basic questions about the client company? Strum of Abby Connect says that his employees’ positive and informed phone attitude is even more important than accomplishing the customer’s task. His clients’ customers should experience a ‘wow’ factor when they call. “We try to wow customers… by giving them the feeling that the person they talked to was capable,” Strum says. Callers find virtual receptionists and answering service representatives to be capable when they demonstrate one key emotion – empathy. Both Strum and Tickle emphasize the importance of a compassionate phone manner. When a voice services employee makes customers feel like both their time and their problems are important, customers end the call pleased. 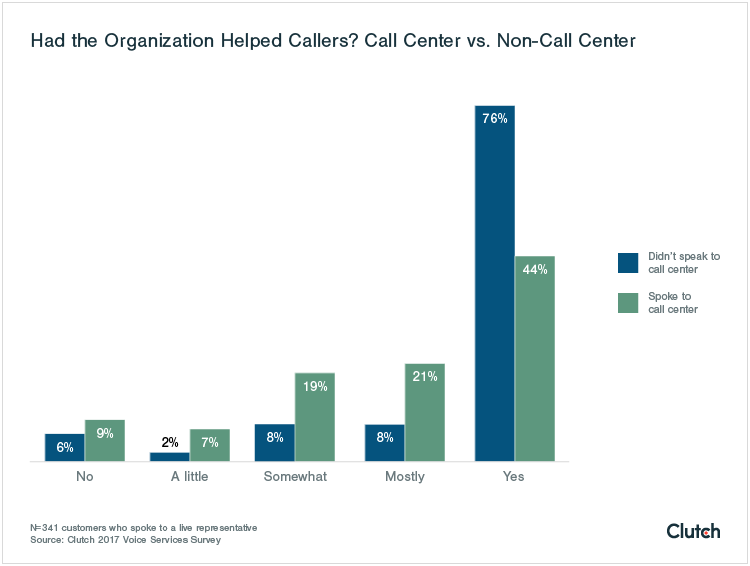 If customers believe they’re speaking with a call center employee, they’re less likely to say that their phone experience was helpful. People who don’t think they’ve spoken to a call center representative have higher rates of satisfaction overall. Over three-fourths (76%) say the organization they called helped them in the end. On the other hand, those who do speak to a call center representative report lower rates of satisfaction. Only 44% of this group says that the organization they called helped them. Call center employees generally don’t provide as much help as dedicated employees of the client company. Customers who decide they’re speaking with a call center representative are less likely to feel satisfied when the call finishes. This trend may be due to a recent division within the voice services segment. Strum of Abby Connect said that “old-school” answering services, or call centers, are more likely to leave a bad impression. “When you call in, you get one of 100 people answering your phone. Usually, all they can do is take a message or transfer you to a voicemail. This type of business cares about volume,” Strum told Clutch. Newer, smaller, more focused providers, such as Abby Connect and EasyBee, prize call quality over quantity. Whatever niche voice services providers fill, they can respond to these statistics by arming their employees with enough information and phone etiquette training to keep customers from ever knowing they spoke with someone outside the client company. Whether you’re a voice services provider or a potential client, remember that customers prefer talking to human representatives who speak clearly and spontaneously, and who help customers without transferring them. If a customer knows they are speaking with a voice services provider, as opposed to the client company, they are less likely to be satisfied. As business process outsourcing grows, the voice services segment grows with it. 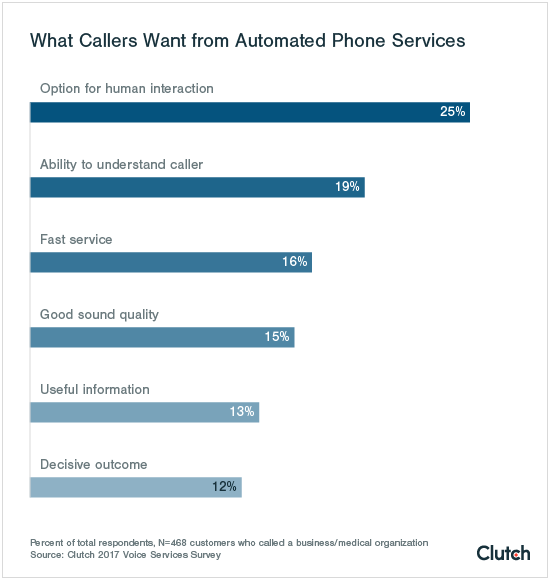 Though little data on voice services is currently available, Clutch expects that to change. As demand increases and the number of skilled voice service providers grows, the business technology world should keep a close eye on the industry. No matter their size, prospective clients can take advantage of virtual receptionists, answering services, and more. That way, companies can spend time fine-tuning their products rather than answering the phone. The survey respondents consisted of 468 individuals who had called a business or medical organization with a question or concern within a month of taking the survey. Just under two-thirds (63%) of respondents were female, while 37% were male. All were from the United States; 40% came from the South, 25% from the Midwest, 18% from the West, and 17% from the Northeast. Provide authentic, empathetic, and efficient conversations when customers call your business. Read detailed client reviews of answering services to find the best provider for your business.